In 2015, Sub-Saharan Africans lost 630 million “healthy life years” as a result of sickness and disease, amounting to an estimated loss of $US 2.4 trillion for the region, a new study finds. These economic losses, it says, emphasise the need for increased investment in health financing in Africa to achieve universal health coverage (UHC) and the Sustainable Development Goals (SDGs). 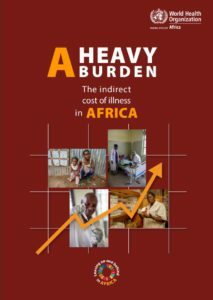 The World Health Organization study, “A Heavy Burden: The indirect cost of illness in Africa,” found that noncommunicable diseases are the largest cause of productivity losses in the region, followed by communicable diseases and neonatal conditions, and that children aged 0-4 years bear the brunt of the life years lost. The study, released last week by WHO’s Regional Office for Africa, was developed to increase awareness of the links between sickness and disease and development outcomes. “This report is an attempt to address this gap in the evidence. It clearly shows that, if we fail to achieve UHC and the health-related SDG targets, the Region will likely suffer a loss of about 2.4 trillion international dollars annually,” Dr Matshidiso Moeti, WHO Regional Director for Africa, said in the study forward. These results “add to the evidence base on the need for greater investment for health in the WHO African Region considering the likely returns on investment,” the study says. It estimates that if the SDG targets on morbidity and mortality are achieved by 2030, 47 percent of the total cost of illness in Africa can be saved in 2030. To achieve this, the study urges countries to “invest adequately in the development of resilient national and local health systems,” and for stakeholders in member states, communities and partners to use this evidence to support advocacy work for domestic spending in Africa. A summary of the study notes that the “unpredictability of public revenues combined with mounting debt pressure is limiting the potential fiscal space that can be made available for health,” and that this gap is mainly being filled by private financing sources through out-of-pocket expenses or insufficient voluntary private health insurance. The study calculated the number of years lost to avoidable illness and premature death using the disability-adjusted life year (DALY) measurement. Every DALY lost is considered as equivalent to one lost year of “healthy life.” The study calculated productivity losses in terms of household and national income lost, as compared to the potential monetary contribution that an individual in perfect health would make to a country’s gross domestic product (GDP). It found that in 2015 an estimated 630 million DALY’s were attributable to the leading causes of illness and premature death in the WHO African Region, which covers most countries of Sub-Saharan Africa. The Democratic Republic of the Congo, Ethiopia, Nigeria, South Africa and the United Republic of Tanzania had the largest number of DALYs accrued overall, amounting to 49 percent of the total DALYs for the region. The Central African Republic, Chad and Angola were the top three countries with the highest DALYs accrued per capita. Based on this, the study calls for increased health investment not only in lower- and lower-middle-income countries, but for all countries across income groups. As figure 2 from the study highlights below, noncommunicable diseases, such as diabetes, heart disease, hypertension and cancer, and communicable diseases, such as AIDS, tuberculosis (TB), and malaria, were the biggest contributors of avoidable illnesses and premature death, followed by neonatal conditions. Young children aged 0-4 years bore the brunt of the sickness and disease in the region, followed by adults aged 30-49 years, and those aged 15-29 years, as shown in figure 3 below. Data for the study was drawn from the WHO Global Health Observatory, the International Monetary Fund (IMF) and the Institute for Health Metrics and Evaluation (IHME). The study uses international dollars, a hypothetical unit of currency that is based on the purchasing power of United States dollars at a given point in time. Image Credits: WHO Regional Office for Africa.